Great Chair Re-Upholstered - Sew What? Sew Anything! - Sew What? Sew Anything! It is always a difficult decision to re-upholster an old piece of furniture. The balance between the cost to re-do versus the sentimental value of a piece is almost always at play. In this instance the great chair re-upholstered won the day. 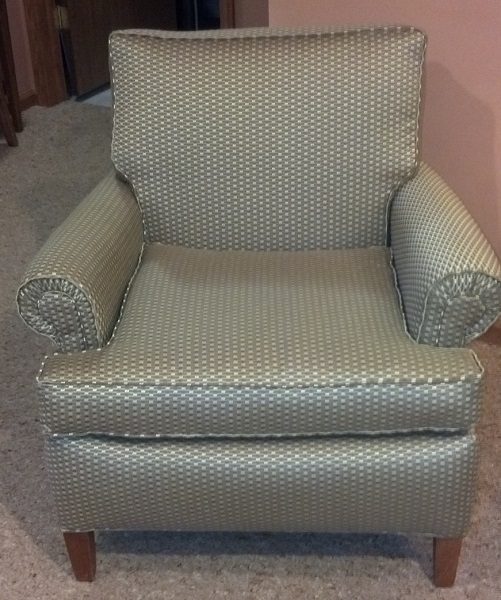 A fabric choice from Grand Rapid’s Luxury Fabrics, Inc., a fabric wholesaler, brought new life to this chair. This chair had been banished to the back room in the basement. Transformed, it became the new comfy chair in a place of honor by the fireplace for this Okemos High School teacher.